Three thoughts on the Utah Jazz’s 110-102 win over the Chicago Bulls from Salt Lake Tribune beat writer Andy Larsen. It’s a defense that the Jazz have faced before this season, but it’s been an effective one for many of the Jazz’s opponents. Rather than chasing the Jazz around screens, the Bulls just went under everything. It’s why the Jazz took over half of their shots from 3-point distance, 45 of their 88 overall field goals came from deep. It’s why Donovan Mitchell took 13 threes and Joe Ingles took 10. It’s also why Gobert only scored one basket that wasn’t a putback. It’s also why the Jazz were outscored 54-32 in the paint: the Jazz had some trouble getting inside with the Bulls cutting under everything like that. There are things that the Jazz could do to get inside. I liked this play, where Kris Dunn goes under against one screen, but then gets surprised with the second. That frees up Gobert for the pick and roll. But even when that happened, the Bulls chose to leave Korver — now again the 4th best 3-point shooter of all time — open in the corner. Given the strategy, it’s probably reasonable to ask that the Jazz shoot better than 35.6 percent from deep. But 16-45 ended up being enough to get the Jazz the win. The Jazz didn’t play terrific defense throughout the game, even though they ended up with a pretty solid defensive rating of 102. But they did do enough by making the lives of the Bulls' leadings scorers — Zach Lavine and Lauri Markkanen — difficult. This play is a pretty good example. Kris Dunn is coming off a screen, where he’s fairly dangerous. 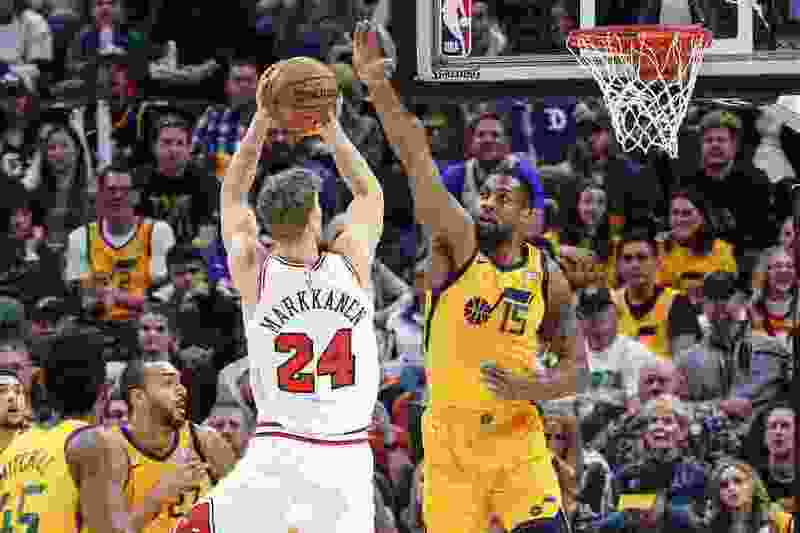 So the Jazz give give two defenders to him, which leaves Lauri Markkanen open. So Donovan Mitchell comes all the way over, completely leaving rookie Chandler Hutchison to defend Markkanen. Markkanen finds Hutchison cutting through the paint, and now Korver drops down to prevent the dump-off pass. Hutchison finds Dunn open, but Dunn doesn’t like shooting the ball— he’s only averaging 1.6 threes per game this season. Crowder thinks about helping off Markkanen, but decides to leave Dunn open instead. Is this great defense? Probably not: leaving NBA players open is not a great idea, even reluctant shooters. But in a scramble situation, the Jazz make a good decision twice, with Mitchell leaving Hutchison to stop Markkanen and then Crowder not leaving him at the end of the play. That’s a little bit of a microcosm for what we saw from the Jazz tonight: probably not their best defensive effort in a back-to-back night, but they did enough to end up with a good result in the end. Markannen shot 7-17 for 17 points, and Zach Lavine shot 7-21 for 21 points, both had inefficient nights. Both players had the most success where it would have been difficult to help from the perimeter. In general, I think that’s something the Jazz have done really well in their recent defensive stretch: they understand the gameplan and execute it very well on a night to night basis. And it’s working: according to Cleaning the Glass, the Jazz have been the league’s best defensive team for the last two months. Two big Jazz milestones were hit today: Kyle Korver regained his spot as fourth all-time on the NBA’s all-time 3-point leaderboard, and Quin Snyder picked up his 200th win as a head coach. For Korver, well, he’s pretty used to being fourth; he had been until Steph Curry passed him up last week, and only regained his spot by passing up Jason Terry on Saturday night. “Quin’s just getting started. As long as his heart doesn’t explode from all the coffee he drinks, he’s going to coach this group for a long time,” Korver said. "He’s a great coach. One of my favorite things about being here is playing for him. That last line will make Jazz fans pretty happy, won’t it?